With 3500 ANSI lumen the VPL-PX40 offers a high brightness. 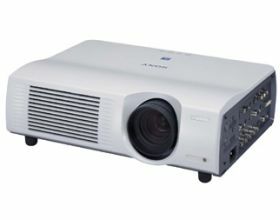 Due to the new LMP-P260, 265W Lamp and new 0.99" LCD Panels with Micro lens the brightness could be increased by nearly 16%. The VPL-PX40 has an improved optical unit with several detail enhancements. The main difference is the L-Shaped design where the lamp is aligned in a 90-degree angle compared to the projection lens. 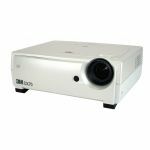 This allows the projector to be used in any upward or downward tilt angle. Also the distance from the lamp to the LCD Panel was shortened resulting in a better efficiency. The entire Signal processing of the VPL-PX40 is now digital up to the LCD Panel Driver. The new digital LCD Driver that feeds the analogue LCD Panel has an improved S/N ratio that now can be compared to a digital driven device. Thanks to this new driver circuit the picture noise and the accuracy could be improved significantly. 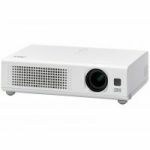 With its new cosmetic design and the built-in direct Power On function, if enabled, the VPL-PX40 will power up as soon as AC Power is supplied. 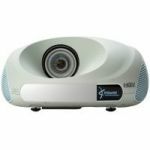 This function allows control of the projector by simply switching the main power line on/off. This is useful in fixed installations. The structure of the optical units allows the VPL-PX40 to be tilted in any upward or downward angle. The VPL-PX40 is equipped with variety of inputs. Besides the standard Composite and S-Video input the VPL-PX40 has 4 independent RGB Inputs and an RGB-Monitor out. The VPL-PX40 uses a new Air Filter. In the past regular filter cleaning was required every 300 hours in order to keep the filter free and avoid overheating of the projector. Now the air-filter needs cleaning every 2000 hours. The VPL-PX40 carries the ECO-info Label from Sony environmental affairs. The ECO-info mark indicates that the VPL-PX40 is environmental conscious product. USB Cable A type to B type 2 m.
RGB cable HD-sub 15 pin, HD-sub 15 pin 2 m.